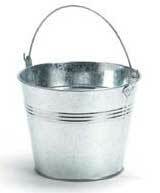 Pilgrim Scribblings: Bucket or Spoon? Recently I've had several cases of memory loss. I had an MRI to check this out and they found nothing, absolutely NOTHING. Carol has been concerned about my mental health so she booked an appointment with a doctor at our local mental health hospital. As part of our session I was given a test. Dr. M. T. Tubbs took me into the bathroom where the bathtub was filled with water. He posed a simple question and I was quick to respond. It was a no-brainer. "What would you use to empty this tub, a bucket, a tea cup or a spoon?" A bucket, of course. The doc quickly began making arrangements to have me committed. "Most sane people would just pull the plug. Do you want a bed beside a window?" PLEASE COME AND VISIT ME!!! It was such a blessing to hear him speak as it was as well last time I heard him! Happy Thursday David! Did you mean that they found nothing wrong or nothing in your head? Oh! That was bad! I am so mean...you know I'm only joking though...right? LOL! I couldn't resist that one...you set it up so perfectly. You really had me going until I read about Dr. M.T. Tubbs....that's a groaner for sure! Dear David...When Bernie gets home from work tonight and I read this to him I, I know EXACTLY what he is going to say. Dear David...When I read this to Bernie, You KNOW what he said,eh? ?